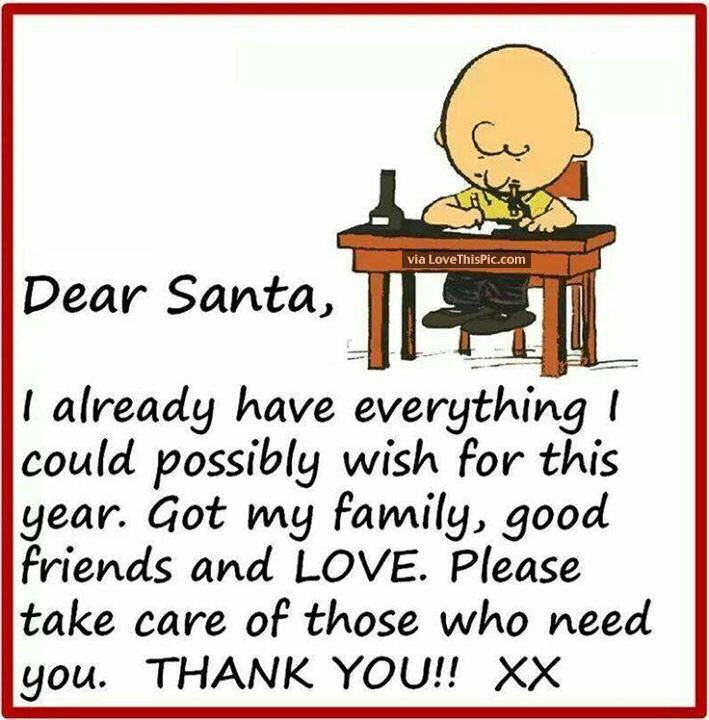 Well, I hope you all had a nice Christmas and are now looking ahead to all the things that are in store for you next year. Our celebration was really nice - Skyped with our #2 son and his family on Christmas eve and had the joy of watching our 1 year old grandson Theo open his gifts from us. Christmas day we drove, very carefully because the roads were pretty dicey, to have a late lunch/early supper with our #1 son and his family. All in all, a wonderful time. It's hard to get a decent picture of a coffee mug, but at least you can see his sweet face! 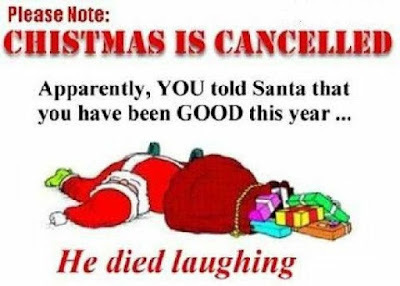 I'll explain a little bit of what I did so you can see that, yes, Virginia, there not only is a Santa Claus....but I DID do something to it!! The areas circled in pink show where I have simply added a little bit of netting to soften the colours of the underlying fabrics. The area circled in red was created using Texture Magic, which 'bubbles' the fabric up into the most amazing textures (looks a bit more tree-like than the flat fabric did). For the areas circled in blue I created some fabric lace using my sewing machine....placed cheesecloth really tightly in a hoop; dropped the feed dogs; and stitched, trying to use mainly circles to create a lacy effect with the cheesecloth. Then I added little snippets of the green fabrics I used elsewhere in the grass and stitched them on. Cut and appliqued to the areas on the grass where I wanted them. 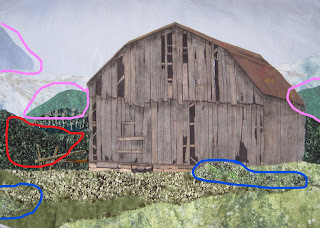 The barn itself has been painted and I also used Sharpie markers to add definition. The fence, after much thought, was created out of a pipe cleaner also 'painted' with Sharpie markers. - THIS is a really pretty crocheted cowl and there's another one HERE. - Sometimes you come across a little tip that makes you wonder why on earth you didn't think of it yourself and THIS is one of them! And THIS is another one. And THIS is a great tip for quilters. - If you're like me and like to make a fresh start in January and have the urge to clean (I know - it doesn't happen often here at Chez Magpie! ), perhaps you might find some of the suggestions on THIS list useful. - THIS is a really nice crocheted basket tutorial - I think I would be tempted to not add the handles though. Today I have a wonderful quote from Ralph Waldo Emerson...."Write it on your heart that every day is the best day in the year" and, because this is likely to be my last post before the new year, I thought I'd leave you with this one, from Neil Gaiman..."I hope that in this year to come, you make mistakes, because if you are making mistakes then you are making new things, trying new things, learning, living, pushing yourself, changing yourself, changing your world"
Only another quilter truly 'gets' what makes up THE best gift - and she knew I had been searching for fabrics for my barns. Aren't these perfect?? AND she also gave me the adorable scrubby and the most incredible scented hand sanitizer. Methinks I'm spoiled! Thank you MEK (oh yes - and there was a tin of homemade goodies too!). - THIS little project/gift could suit either a man or a woman and there might be time to create a few before Christmas. - Pat Winter has her 2018 crazy quilt calendar available and you can find out more HERE. - THIS is an intriguing use for old t-shirts. - HERE is a really cute crocheted hat pattern. I'd like to make this one (altho' I would never wear it - I'm so not a hat person!). - THIS little fellow would be cute to make for ornaments - perhaps not for this year, but you can bookmark it for next year. Today the quote is from Larry Wilde..."Never worry about the size of your Christmas tree. In the eyes of children, they are all 30 feet tall"
Another of the postcards. Sorry that the quality of the photos is dismal - obviously I took the pictures on a day the sun was in hiding. You can get the general idea though. WARNING: A RANT IS ABOUT TO HAPPEN!! Many of you will remember my -itching awhile ago about my new sewing machine (due to the unfortunate accident that befell my oh-so-beloved Janome) and the ensuing 'fix' from the shop (for the new machine, not my Janome, unfortunately). Over the weekend I started creating a new barn landscape which requires the use of a zig zag stitch and (fingers crossed) invisible thread. Well, all I have to say is, under NO circumstances, ever consider buying a Bernette 20 sewing machine. No matter what I do it will not cooperate. I have tried every single tension setting.....I have tried every single suggestion that came from my loyal readers (and several more I found elsewhere online).....I purchased a fancy metal 'holder' that ensures that the thread feeds correctly off the spool into the sewing machine.....I even went so far as to use the suggestion of taping a safety pin to the side of my machine and running the thread through that for additional tension. Hah. My machine continues to thumb its nose and I'm certain I can hear it saying 'gotcha again'. The words I'M saying are definitely not so nice!! In a perfect world Santa would come out of the woodwork and there would be a new Janome under the tree this year, but alas poor Santa hasn't won the lottery lately. So....I guess I'm in for a ton of hand stitching. Now that you have read through the rant (or perhaps skipped right over it, for which I wouldn't blame you! 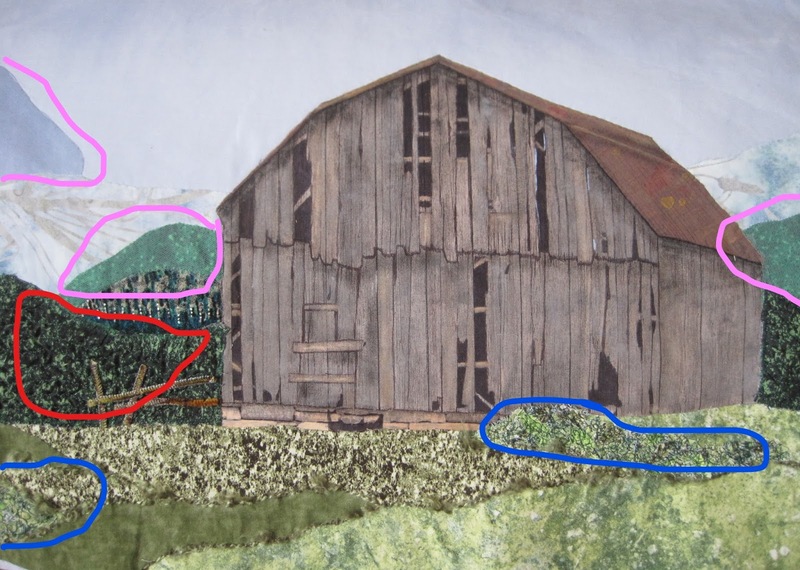 ), how about a picture of the beginnings of the next barn landscape? - Many of us likely have one of those clear glass vases from a floral arrangement lurking about in our cupboards somewhere, and if you do, how about THIS fun idea (and HERE is a crocheted version). These would be cute filled with candies or even more flowers! - HERE is another fun creation for your Lego fans to try out over the holidays. OR maybe they might have fun creating THESE. Maybe THESE too! - If you are interested in genealogy perhaps THESE free charts might come in handy. 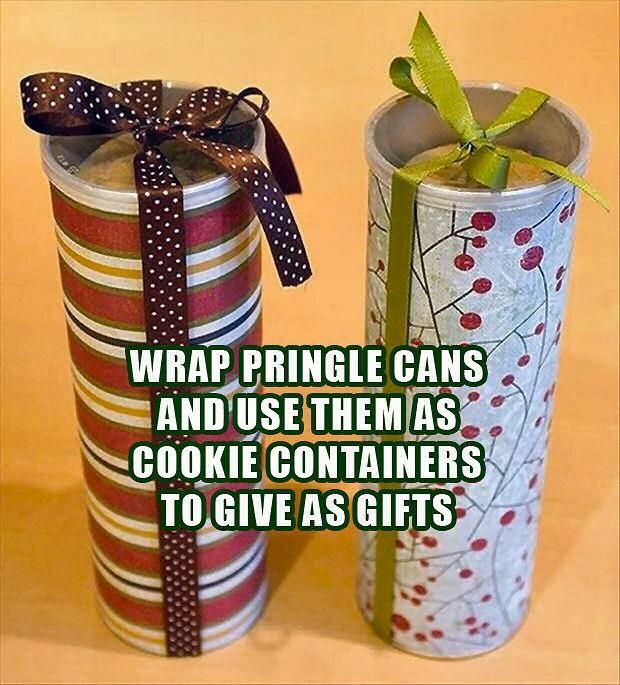 - HERE is a really quick project you can still make in time for gifts for Christmas. - THIS is another quick little make. - And another thing to make you say 'awwwww' HERE. No pattern, unfortunately. - For the knitters, you can find access to a number of ways to knit in ends as you go HERE. Your quote today is from W. J. Cameron..."There has been only one Christmas....the rest are anniversaries"
This is another of the postcards. Remember the other day when I showed you a picture of our 'Kibbles 'N Bits' (aka Nuts and Bolts)? I've had a couple of people wonder why/how here at Chez Magpie they have earned that name. It came from a tv ad for dog food by the same name. We absolutely loved the ad and for some reason the name seemed to work for the recipe. I found the ad and if you'd like to see it, have a look....https://www.youtube.com/watch?v=0Ml16YWlMNQ If you watch it closely you can see the dog food. See the resemblance??? - THIS is an amazing tea cozy pattern (you'll need to use the 'translate' feature). - THIS is one of those things that you probably wouldn't be able to make in time for Christmas, but it's something that makes you say 'awwwww' right out loud. - There are fun possibilities in THIS gift idea - and the recipes are there too! You could add one of THESE to this gift. - If you're searching for a really nice table centerpiece for the Christmas season, there's an easy how-to HERE. - For those of us with an over-abundance of buttons in our stash, perhaps making a few of THESE would be just the thing. - Or maybe THIS would be a cute little gift for a knitter. - Although you would have to buy a couple of the supplies for THIS - it's something your kids would get an amazing amount of fun from, particularly when they're at loose ends over the Christmas holiday. - Personally, lavender makes me sneeze so I can't be around it (despite loving the scent), but perhaps you might find some of the gift ideas HERE of interest. In yesterday's comments, Sarah asked how I do my images for my crazy quilts, so I thought I'd answer here so everyone can know. The images I use come from the internet - just search 'Christmas images - free' (or whatever criteria you like). Then I save them to my word processing program on the computer and re-size them to suit whatever I'm creating. You can usually get several images on one page. I then choose either a white or off-white fabric with a fine weave (good quality cotton is my preference). Press it really well to be sure there are absolutely no wrinkles. Cut a piece of freezer paper (the stuff that butcher's use to wrap meat - waxed on one side) to approx. 10 x 13" and press it onto the fabric. Re-cut to measure 8 1/2" x 11" and then carefully re-press the edges to be sure they are adhered thoroughly. Make sure there are no loose threads anywhere. (Note: you CAN cut your freezer paper to 8 1/2x11" to begin with but in my experience the edges never seem to adhere properly and often catch in the printer). At this point I run a 'test' piece of paper through my printer so that I know which way up to place my fabric. If you're satisfied, load your fabric/freezer paper sandwich and print. Press really well once again to 'set' the colours as much as possible. Remove freezer paper and use in your projects. NOTE: This process is NOT water proof, so don't use it in anything that you plan to wash.
- If you crochet and you have a pianist in your life, perhaps they'd appreciate THIS. - THIS is a quick-to-make gift for a tea lover you know. - Three different versions of chocolate bark HERE. - THIS might take a wee bit of time (and some tools - or a handy hubby!) to make, but I love the look and it would be useful too, particularly if it were gifted with a cookbook. - THIS is one of those things I'm sure we've all done at some point, but perhaps a wee reminder might be in order. It's a perfect gift for a teacher, a shut-in, a neighbour...or....?? AND, how about THIS packaging idea for cookies?? - I love this packaging idea for a pair of slippers. And how about THIS way to give the gift of cash....so much more fun that simply putting it in an envelope! - I like THIS idea to gift a knitter or crocheter with a ball of yarn and some small knitting tools. Or a fisherman with some lures (use twine instead of yarn)....or......?? Today your quote is from Francis of Assisi...."For it is in giving that we receive"
There were three aluminum turkey roasting pans filled with what we call 'Kibbles 'N Bits' (probably better known as Nuts & Bolts). Our recipe calls for more 'bits' than the traditional one...hence the massive amount it makes! There was one on either side of the sun (they're called 'sun dogs' - not sure why). What an amazing framework for the sun! Of course they were much more brilliant in real life. Don't know if you can see the snow piled on the tree branches....we were rather dumped on over the past 24 hours. - I don't often mumble about something where you need to buy the pattern, but THESE are so cute (and not expensive) so thought I'd share. - If there's a Lego fan in your midst and you're searching for something to keep them busy as they anticipate the arrival of Santa, perhaps they might like to create THESE. - And HERE's another thing that can entertain both youngsters and adults alike. - THESE are rather cute - would look nice hanging on a tree - or used as a topping on parcels. And if your kids like those Kinder Surprise Eggs, perhaps making some of THESE would be a fun surprise for them (you'll have to use the 'translate' feature). Today your quote is from Henry David Thoreau...."The way you spend Christmas is far more important than how much"
Some of you will remember my moan awhile ago about how I managed to spill my glass of water onto some crazy-quilted postcards I was working on and how the ink ran on the images. The surviving ones were completed and mailed out and I think they have all been received now, so I can show you. I'll share the rest with you over the next few posts. - I stumbled across THIS recipe and it's going in my 'idea' file for next Christmas (if I can wait that long!!!). And if you want even more great-sounding (and looking!) Christmas recipes have a look at some of THESE! - For those of us who might like a check list to help us declutter after the holidays, how about THESE monthly charts? Or how about THIS list?? - THIS tutorial calls for using wool sweaters, but I don't see why acrylic ones wouldn't work just as well. HERE is another use for old sweaters and another version HERE and HERE. I have a pair and they are the toastiest mittens I've ever owned. - Kathy Shaw has posted her list of upcoming *Free* 2018 online classes for crazy quilting (and will be updating that list to include 'sane' quilting classes as well. Go HERE for further info. - HERE is a cute tutorial for making a matching dress for a little girl and her doll. Today your quote is from Norman Wesley Brooks..."Christmas is forever, not just for one day. 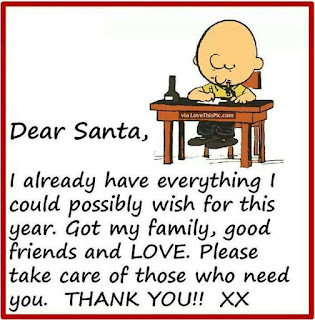 It's for loving, for sharing, for giving....not to be put away likes bells and lights and tinsel. The good you do for others is the good you do for yourself." I've been toying with the thought of making soap for several years and this became the year. The picture isn't very clear (sorry!) but I was trying to show how I packaged them. Melt & Pour soap (purchased from HERE), some done in a feminine scent and some in a masculine....wrapped in light-weight brown paper....added a colored band made from scrapbook paper....a label (from Avery, printed on my computer) and the whole thing encased in little cellophane bags. They smell so nice!! - The amazing Stephanie of 'The Enchanting Rose' has a lovely little series happening on her blog involving making yo-yo's and some wonderful things you can do with them. The first post is making a really pretty garland and you can find that HERE. She is doing 6 different projects and if you continue to check back you will see what else she creates. - HERE is a really pretty way to combine fabric and crochet to make a quilt. The pattern isn't available, but she does give links to find how to make it yourself. There's another version (with tutorial) HERE. I love the Victorian look as shown, but also wonder what it would be like done with denim? - THIS is a great way to keep your yarns from tangling. There are more great ideas HERE. - One (or several) of these would make a really nice gift. - THIS is one of those really cute things that would be fun to make - and not a calorie to it either! - THESE would make great little stocking stuffers. Today I have another quote from an anonymous source...."A friend is someone we turn to when our spirits need a lift. A friend is someone we treasure, for friendship is a gift. A friend is someone who fills our lives with beauty, joy and grace. A friend makes the world we live in a better and happier place." This is a sweater for our oldest grandson. Pattern is 'Flax' by Tin Can Knits and can be found in sizes from 0-6 mos. up to 4XL HERE. I used Vanna's Choice yarn and it worked up beautifully. An easy pattern with just enough interest to make it not at all boring to knit. I will be making this one again. - HERE's a really nice cross-stitched Christmas card pattern (or would make a nice ornament too). - HERE's a nice hat pattern that might be a good gift. THIS one too. And THIS one. And ANOTHER one. Or how about THIS one. - For those of you who are Harry Potter fans (or if you know someone who is) perhaps THIS might make a great gift. - HERE is a lovely crocheted basket that would be a perfect gift. - THESE would be so cute on a Christmas tree - or - as a little garland - or.....?? Or, if you want something just a tad more complicated, how about some of THESE? - I found THIS which 'says' it's a potholder but to my mind it would make a beautiful piece of Christmas decor - or perhaps tucked into the Christmas tree. - and just to make you feel good, how about spending a few minutes watching THIS? I love the horses!!! It seems the company has decided not to use the wonderful horses in their recent commercials and I think it's their loss.